April 05, 2019: The West Bengal 2019 Results will be declared, if sources are to be believed, in the last week of May 2019. This follows the same pattern as result declaration in previous years. We will update the date and time of when the WB Madhyamik Result 2019 will be declared as and when the announcement is made by the official authorities. All students, private and regular, can check their West Bengal Board Madhyamik Result 2019 here on this page. Students can also check their Madhyamik result 2019 on our Android app. The West Bengal Board of Secondary Education were conducted the Madhyamik Examination for the academic year 2018-19 from 12th of February 2019 - 21 February, 2019. The detailed time table can be read here. The Board declares the West Bengal 10th result 2019on the official website (wbresults.nic.in) of the West Bengal Board and on examresults.net website as well. The Madhyamik pariksha result for 2019 can also be accessed via our recently launched app, ExamResults, available on the Google play store. Madhyamik exams are conducted to test the educational abilities of children in secondary school and assess if he/she is being worthy of being certified as having successfully completed his/her secondary schooling level examinations. The Madhyamik examination is given different names by different boards in India. Type the desired state name, for example, examresults.net/wb/. Look for the desired board button, for example the button that says WBBSE Results Click Here. Click on the link, fill in your Roll Number and other requisite details. Your WB Madhyamik result 2019 will be displayed. Another way for students to stay on top of all exams- and WBBSE results related notification is to download our recently launched free app, ExamResults. The WB Madhyamik Result 2019 is expected in the third week of May. Last year the same results were delayed than usual and were declared in the month of June. Detailed below are some of the other statistics related to the WB Madhyamik board exams conducted in 2018. These stats can help determine the pattern for West Bengal Madhyamik Result for 2019. The topper of 2018 West Bengal Madhyamik Exam was Sanjivani Debnath of Suniti Academy in the north Bengal district of Cooch Behar. She scored 98.4%. 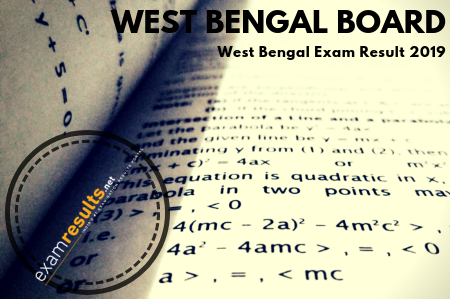 West Bengal has 23 districts where the exam was conducted. The East Midnapore had maximum passing percentage of 96.13% followed by West Midnapore at 91.75% and Kolkata at 91.11%. The overall pass percentage of students who appeared in the West Bengal Madhyamik exam 2018 was 85.49%. Post registration and examination analysis tells us that approximately 11 lakh students appeared for the WB Class 10th exams and were awaiting their WB 10th results. The pass percentage and other statistics for West Bengal Madhyamik 2019 will be updated once the WBBSE Madhyamik Result 2019 is declared. Students appearing for the West Bengal Madhyamik exams 2019 can check their Madhyamik result 2019 on the official results website of the West Bengal board, wbresults.nic.in or on examresults.net. Students can also check the WBBSE result 2019 is to download our recently launched Android app, ExamResults. Along with access to the Madhyamik result 2019 it will also keep you updated about when the wbbse results are expected, the Madhyamik result 2019 date, the latest news about the boards, and any other information you are looking for. The West Bengal Board of Secondary Education (WBBSE) was established in the year 1951. Currently, there are 10,238 schools in West Bengal that are affiliated to WBBSE. It was started through the West Bengal Secondary Education Act passed in 1950. The board is entrusted with several responsibilities which include creating the curriculum, creating education policies, monitoring their implementation, and also conducting the Class 10th or Madhyamik board exams every year. The official website of the WBBSE is wbbse.org and students can check their WBBSE Madhyamik result on the wbresults.nic.in and also on this website, here.